Libertad striker Oscar Cardozo managed to find the back of the net from the half-way line during his latest appearance in South America. The Paraguayan-based club faced off against The Strongest in the Copa Libertadores on Wednesday and they ran out 5-1 winners, thanks to a hat-trick from Adrian Martinez and goals from Cardozo and Carlos Rivero. 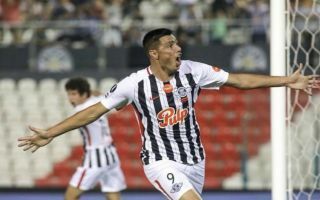 Libertad progressed to the third round of the competition with a 6-2 win on aggregate over two legs and Cardozo managed to score not only the standout goal of the tie but possibly one of the best goals seen in any league in the world this season. With 86 minutes on the clock, the ball broke to the 35-year-old just inside his own half and he decided to go for goal, smashing the ball over the Strongest goalkeeper’s head and into the net. Check out Cardozo’s outrageous goal of the season contender below, via Twitter.